While we do offer subs, salads, and pastas, Milanos Pizza is best known for our hot, homemade pizzas. Come in and sit or have us deliver to your Idabel, Oklahoma, home. Our mouthwatering entrees range from $10 to $30. We do offer a daily special every day for our pick-up customers! Pick-up your large, single-topping today and get it for $9.99 plus tax! Tease your taste buds with our customer favorite pizza: Bacon Chicken Ranch Pizza. This mouthwatering dish is dressed with creamy white sauce, tender chicken, crispy bacon, and a blend of bubbling mozzarella and cheddar cheeses. Our newest pizza is the Philly Cheesesteak pizza. You'll devour this well-seasoned combination of Philly steak meat, savory onions and bell peppers, with a choice of creamy white or tangy red sauce. For a light, fresh flavor with a hint of the garden, we offer the Greek Pizza. This unique pizza starts with rich white sauce, but we mix savory chicken, zesty tomatoes, and gooey cheese with a touch of Mediterranean seasoning. Vegetarians are not stuck with just a plain cheese pizza. 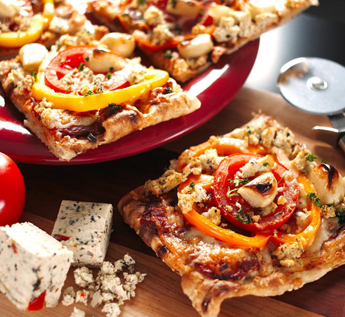 We offer a Vegetarian pizza that is sure to hit the spot. Our scrumptious combination of mushrooms, peppers, onions, green and black olives will leave you satisfied, but craving more on your next visit. If you love tacos and pizza, you'll be delighted to know that we've combined the two flavors. Get a taco pizza today.